The Yale Club of Los Angeles invites members of the Princeton alumni community to the Latino Inter-Ivy Winter Happy Hour. In affiliation with ALPA, YLAA, DALA, MIT, Cornell, Harvard, Columbia, Brown & University of Penn. Come network and meet your fellow alums on Dia de los Reyes! 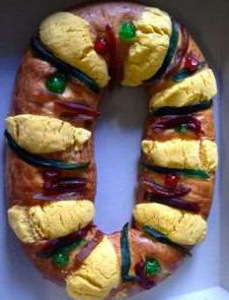 We will bring a few roscas de reyes to enjoy. RSVP so we know how many roscas to bring. Please find us in the upstairs outside patio area. Parking: Nearby public parking lots free for 2 hours and ample street parking. No host bar. Bring your friends. The more, the merrier! RSVP at the Yale Club of Los Angeles Website. Please be sure to place your school affiliation under Organization. For more information, contact Vanessa at vanessa.vasquez @aya.yale.edu.